I am so excited that I have found a way to use the rest of the wool sweater that I have already made two pairs of mittens and two hats from. I had some leftover fabric from the upper arms of the sweater with no finished band, so I was in a quandary. I decided to use some directions I found for felting (wash it in hot, rinse in cold and run through the dryer). 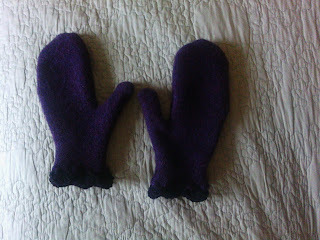 Then I cut out a pair of mittens for my youngest daughter. I zig zagged the bottom of the mittens for good measure, sewed together the mittens and wanted a finished edge. I decided to drag out my long lost crocheting skills and crochet a scalloped edge like I used to do for baby blankets. I found some black yarn in my daughter's closet along with a crochet hook (she is away at college.) I am very pleased at the way they turned out. We also got the metal wall hanging put up on the side of the house. Additionally, our neighbor came over and helped us cover up the ditch between the house and barn where we had laid the wires for the photovoltaic system. We basically only had to move a little dirt after and rake it evenly. I love that we have an awesome neighbor with a skid loader! If you haven't been to Permies.com in a while, it's got a whole new look that is very user friendly. I was brainstorming on there with a like-minded person and we figured out you can use your greenhouse for a nursery in the spring, to dehydrate fruit and vegetables in the fall, and to hang out your laundry in the winter. I love to maximize use, don't you?